Hiro first appears in chapter 37 and is revealed to be possessed with the spirit of the sheep. He's an obnoxious brat at first but quickly matures through the series. Along with Kisa, he's the youngest of the zodiac members and struggles with the fact that his youth prevents him from being an adult who can protect his loved ones. Kisa is his love interest and is usually the only person who can rein him in when he starts to go off on a tangent. When we first see Hiro and Kyo interacting, it's at Kazuma's dojo and Hiro has just stolen Tohru's personal journal that holds the picture of her mother in it. Hiro says that Tohru's dumb for carrying it around with her and giving it to him and Kyo gets fairly angry, accusing Hiro of stealing. He grabs Hiro by the collar and tells him to give the journal back immediately and he eventually does when Kisa appears upset at his actions. He manages to get Kyo even angrier when he hurls the journal at Tohru rather than hand it to her politely. Eventually summer comes and when everyone goes to the Sohma's summer villa, Hiro and Kisa come along as well. Hiro ends up insulting Tohru by asking her why she doesn't carry a photo of her father with her since he's dead as well. The next day, Tohru appears to be alright but when Kyo joins them outside, he smacks Hiro upside the head and demands to know if he's done anything to hurt Tohru (again). Hiro asks what he's talking about since Tohru's acting fine and Kyo says that she seems lifeless. Upon further observation, Hiro realises that Kyo's right and feels bad for hurting Tohru in such an immature way. About a year later, Hiro has grown quite a bit and is at Shigure's with Kisa when Kyo arrives home after school. Kyo demands to know how they got inside since no one was around and Hiro takes the opportunity to play around with Kyo before admitting that Shigure had let them in himself before leaving. Kyo's completely irritated by Hiro's attitude and eventually leaves him and Kisa alone. Kisa says that Kyo's actually a nice person and observes that he's usually very nice to Tohru; Hiro reflects back to the previous summer where Kyo demonstrated some keen insight into Tohru's behaviour and agrees with Kisa. Later that same day, Tohru, Yuki, Momiji and Hatsuharu arrive from school (Kyo is upstairs) and they all make arrangements for dinner. When Tohru and Kisa are out of earshot, Hiro asks Yuki and Haru if Kyo likes Tohru. Yuki seems a little disturbed that it's obvious even to a middle-schooler and asks if there's a problem with Kyo liking her. Hiro says no, but seems concerned because the cat is supposed to be locked away at the end of the school year. Yuki and Haru are both exasperated at Hiro for always bringing up topics that no one wants to talk about. 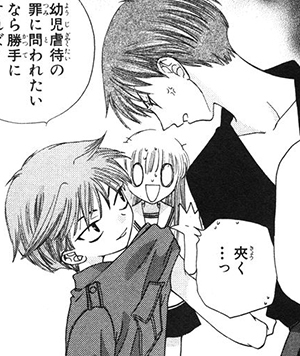 xD Hiro says he's not against Kyo and Tohru being together. The next time Hiro and Kyo cross paths, it's after Hiro's curse has been broken and just after Kyo has confronted his father. Kyo is throwing up as Hiro and Kisa pass by and they stop to ask if he's alright. Kisa offers to help clean up the mess and both Hiro and Kyo object. Hiro calls Kyo dirty for throwing up in such a public area but goes with Kisa anyway to see if they can borrow some cleaning supplies. They meet again later at the final banquet where Akito tells them all that they are free. The last time we know of them interacting with each other is when Kyo and Tohru leave town. We don't see this happen but Hiro and Kisa talk about going to see them both off. Hiro was a very hard character for me to like in the beginning; he was rude and arrogant and treated Tohru very poorly… but as he struggled with wanting to be an adult and grow out of his childish behaviour, I grew to like him more. His relationship with Kisa is very sweet and it's cute to watch it develop through the series. I quite enjoy the interaction that they do share in the series though. Kyo constantly puts Hiro in his place… or at least tries to! I have to admit that when I wasn't much of a fan of Hiro, I was sort of happy to see Kyo yell at him or manhandle him a bit. xD Kyo definitely seems to forget that Hiro is just a sixth grade student at first and scolds him like he would anyone else his own age. I kind of respect that about Kyo and maybe Hiro does a little bit as well, since he doesn't really like the fact that he's immature. Hiro, despite his attitude, does seem to genuinely care about those around him. At first, I don't think he really cares much that Kyo is destined to be locked away for the rest of his life. This coincides with his inability to really think about others around him but as he grows as a person, it seems that he does seem to become concerned with Kyo's future and how it would impact Tohru.